NCE has been developing and manufacturing DCC Products since 1993 when the company was founded by Jim Scorse, a graduate of Rochester Institute of Technology. NCE is a full time electronic design and manufacturing firm devoted entirely to the development and sale of products for the control of model railroads. When modellers are introduced to NCE products, a common expression is WOW! NCE has become a benchmark for “Usable sophistication”, “User Friendly Control” and most importantly “Comfortable learning in DCC”. Whilst it looks like it has as many buttons as an average Audio visual system remote control, the control layout is actually very cleverly arranged so that it can be used with only one hand and ALL commonly used buttons and knobs are within reach of one finger whether you are right or left handed. Additionally, the NCE ProCab (used for both PowerCab and PowerHouse Pro systems) has ability to control the maximum possible 28 separate decoder functions and it also has really readable super clear display, plain English approach and logical layout making it a snap to operate with, and even those new to DCC can operate it comfortably within just a few minutes. 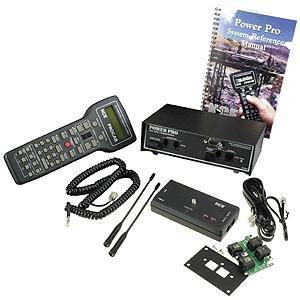 NCE released a very clever “Mini-panel” which simply plugs in as if it were another handset, and has the ability to add lots of layout automation through very simple “on screen programming” with an NCE handset from either PowerCab or PowerHouse Pro.This really low cost item will let you add loco by loco specific automation and in concert with simple detection, makes easy shuttle control and similar desirable automation accessible easily in DCC for the first time! If you need more than a single Mini-panel can do, you can just as easily add yet more Mini-panels!